It’s probable that a majority of the country has been exposed to an Iron & Wine song without even knowing it. A moniker for singer-songwriter/multi-instrumentalist Samuel Beam, Iron & Wine’s melodies have been used in Twilight, a Nicholas Sparks movie, an M&M commercial, and more. But to say that this is at all indicative of the caliber of artistry Beam is capable of expressing would be simply untrue. He never set out for commercial success, and even after gaining some, he’s managed to keep the reigns on his career and move it into the direction he so chooses. Starting as a lo-fi project recorded in his bedroom, Iron & Wine first cropped up in 2002 with THE CREEK DRANK THE CRADLE. Over the next few years, he joined the likes of Bon Iver and Sufjan Stevens, leading the indie folk scene of the mid-2000s. His later albums saw him pushing towards a fuller sound, and away from folk almost entirely. After an experimental bout on 2011’s KISS EACH OTHER CLEAN, Beam took a break from solo work to collaborate with musicians such as Ben Bridwell and Jessica Hoop. 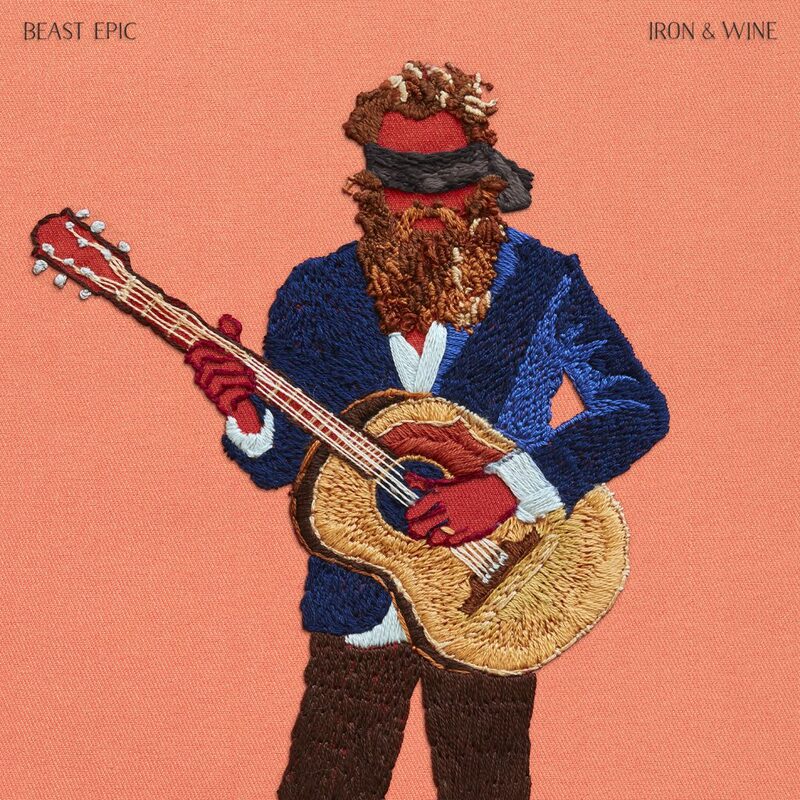 Iron & Wine’s first solo material in years is delivered to us in the form of BEAST EPIC, the title of which refers to a story whose animalian protagonist acts with human-like traits. With BEAST EPIC’s tasteful accompaniments and lyrical wisdom, Beam is able to elevate a collection of already-strong folk songs to new heights. As of late, Iron & Wine’s trajectory has seen Beam pushing towards more unconventional soundscapes, a deliverance from his standard batch of songs. A touch of his more idiosyncratic songwriting returns on “Last Night,” with rickety strings and xylophone, feeling a bit out of place amidst the rest of BEAST EPIC. It’s still a fair attempt to stir the pot, as a full album of swaying folk ballads can become stagnant. On the other side of the coin, the most straightforward song on the album, “Call it Dreaming,” is somehow able to avoid the trappings of blending in too much. Although treading well-known territory, the song feels miraculously fresh. For BEAST EPIC, Beam focuses on live performance acoustics with minimal audio dubbing, creating a sound that feels both warm and hollow. It’s not empty, but rather it feels as if Beam is performing these songs to a candle-lit audience. It no longer sounds like he’s humming these songs to simply a lover or to himself—he’s pushing them out into the world. The memorable album closer “Our Light Miles” echoes in a way that gives it space to expand. It has a gorgeous swell, only for its second half to trickle back to a hush. It’s not very often that we see an artist come full circle—presenting a sound and developing it, abandoning it altogether, and finally returning to it with new light. The result is a mature album that feels universal without being general. BEAST EPIC expresses sagacity without feeling hackneyed. And with current affairs, where it feels like the world is being held together by a thin ball of twine, music like this is more important than ever before.